Sunday 17th March is St Patrick’s Day – the patron saint of Ireland, but it is not only in the ‘emerald isle’ that this day is cherished and celebrated as it’s reported that St Patrick’s Day is celebrated in more countries than any other national festival. St Patrick’s Day was made an official Christian feast day in the early 1600s and is observed by the Anglican and Catholic Church alike. The Church lifted Lenten restrictions and it became a traditional day of feasting and drinking which has continued into the present! St Patrick lived in the 5th century A.D. and was a British Christian missionary who introduced Christianity to Ireland, which at that time, followed mainly the Celtic pagan religions. He was believed to have been kidnapped at the age of sixteen, taken by Irish raiders and made to work as a shepherd, during which time, he reportedly ‘found God’. After 6 years, he escaped, returned home and became a priest, vowing to return and bring Christianity to the county that had enslaved him. After returning to Northern Ireland, he converted many to his own religion, and was eventually made a bishop. One interesting myth says that St Patrick was able to drive the ‘snakes’ out of Ireland, but since Ireland has never had any snakes, this is most certainly an allegory referring to St Patrick driving the druids into the south of the country. The shamrock is a sprig of white clover that grows in the winter and was used by St Patrick to explain the Holy Trinity because it had three leaves, representing the Father, Son and Holy Ghost. It was also said to represent faith, hope and love too. The shamrock has been used as the emblem of Ireland for centuries but many people today, confuse it with a lucky four-leaf clover, and you will upset many an Irish patriot if you confuse the two on St Patricks’ Day. How can you celebrate St Patrick’s Day in your setting? To help you celebrate St Patrick’s Day in your setting, we have come up with 3 areas of the EYFS and suggested 3 activities in each. We hope they will help you celebrate the day in true Irish style. A ceilidh is a traditional Irish celebration involving dancing with partners to traditional music. You can use skipping, gallops and hops to move around the room in an anti-clockwise direction, and you can make up some simple routines yourself or visit www.setdancing.com.au/free-resources/ for some more ideas and free resources. If you want to try out some traditional Irish step dancing, ‘Riverdance’-style, have a look at this YouTube video for some basic steps that all can enjoy. Traditional St Patrick’s Day parades are held all over the world so why not organise one for your setting? You could make some green, white and orange flags and some carnival-style floats using painted cardboard boxes with different Irish symbols or images. There are a whole host of ideas for St Patrick’s Day recipes from green cupcakes to shamrock-shaped biscuits. A few minutes spent searching the internet will reveal lots of simple recipes for pre-schoolers but we like the ones here which include lucky green pancakes and a green, white and orange popcorn and pretzel party mix. Since we are focusing on the number 3 in the shamrock, why not cut out and colour in some shamrocks, numbering the leaves? If you have older groups you could count up in sets of 3 – for example, 1, 2, 3; 4, 5, 6; 7, 8, 9 and so on. Create a ‘treasure hunt’ around your setting with clues to follow to lead your children to the pot of gold….eventually. You can use gold chocolate coins for a reward if they solve the clues correctly. St Patrick used the number 3 to explain the Holy Trinity but you could create a display related to the importance of the number 3 in everyday life: for example, different types of triangles, March being the 3rd month; past, present and future; 3 primary colours of red, yellow and blue – the list is almost endless. 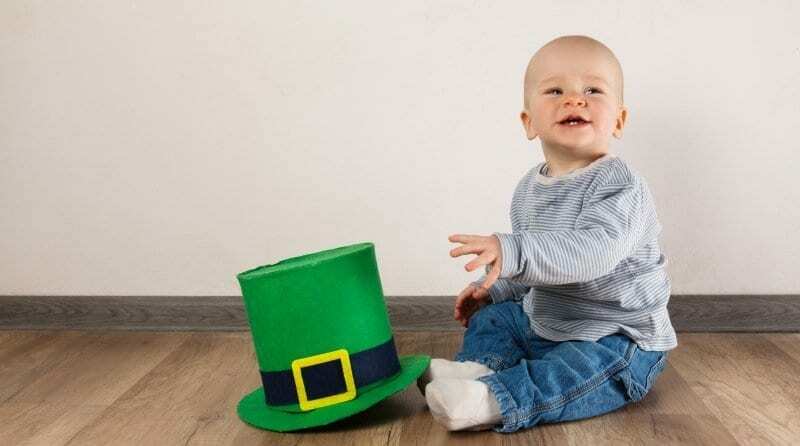 The mischievous little leprechaun, sitting with a pot of gold at the end of a rainbow, is a traditional Irish image. Why not paint a large mural to show the colours of the rainbow and make a ‘pot of gold’ for the end of it, guarded by a leprechaun? But be warned, if you introduce a naughty leprechaun into your setting, who knows what havoc he will wreak during the week – so plenty of opportunity to have some mischievous fun with your children here! A harp is a traditional Irish instrument and you can easily make some using an old shoe box and some large elastic bands. Stretch the bands around the box to create the strings. Investigate the difference in sound if you use different sized boxes. There are some wonderful nursery rhymes and songs on the theme of St Patrick’s Day. One of our favourites is “I’m a little leprechaun”, sung to the tune of “I’m a little teapot” which you can find here – guaranteed to have you singing in the staff room! Find other song ideas here. However you celebrate, have fun, and watch out for those naughty leprechauns!